"These people think because of the color of your face or your religion you’re not American." David Salha and his wife at their property in Lupton, Michigan. WEST BRANCH, Mich. -- A Muslim man planning to build a secular summer youth camp in Michigan says he’s dumbfounded by accusations that it could be used to train terrorists. David Salha wants a special use permit to construct the camp on his 150-acre vacation property in the rural town of Lupton -- a bucolic community that’s 200 miles north of Detroit, where he owns a mattress store. The father of seven needs the Ogemaw County Planning Commission to approve his request, but attempts to get permission have been delayed as local residents cited concerns about noise, infrastructure, environmental impact -- and terrorism. One county resident, Carol Sappington, said at the planning commission's June 24 meeting that she’s opposed to the idea because she fears the Islamic State group, also known as ISIS. Her remarks were similar to Islamophobic comments made on local websites and by residents at a Rose Township board meeting earlier that month, where the panel voted to request the county commission deny the permit. “Is there anything written on paper that says this isn’t going to be turned into a terrorist training facility?” Bob Clark asked the board during the meeting, according to The Ogemaw County Herald. Reetz also called for a federal investigation of Salha, who is flabbergasted by his neighbors’ reactions. “It was disgusting. It made me sick to my stomach,” Salha told The Huffington Post. Salha gave permission for the FBI to release his records to HuffPost, though the agency has not yet responded to that request. Hanan Salha is scared to visit her family's vacation property in rural Michigan after hearing Islamophobic comments from members of the community. His 15-year-old daughter, Hanan, the only one of five who chooses to wear a headscarf, is also scared to be in Lupton. After her family attended the June planning commission meeting, a neighbor said it was "brave" of Hanan to stand up, leaving her questioning her safety in a community where simply practicing her faith requires courage. Salha claims he received a threatening phone call from a self-identified ISIS member. The call unsettled him, though he believes it was a prank. He said his barber in the Detroit area now refuses to cut his hair to avoid any perceived connection to ISIS. A petition against David Salha's camp proposal was signed by 150 people and delivered to the planning commission. Salha, who emigrated from Lebanon when he was 8 years old, is a U.S. citizen. He doesn’t strictly follow Islamic law and chooses to be called by his Americanized nickname, David, instead of his given name, Nayef. His wife, stepson and some other family members are Christian. “These people think because of the color of your face or your religion, you’re not American,” he remarked recently as he ate a burrito during Ramadan, the holy month when Muslims traditionally fast. Goodar Township Treasurer Bob Quillen told HuffPost he doesn't believe Salha is a terrorist, but still has unanswered questions. Quillen said he instead aims to represent dozens of residents who told him they object. Salha "is flat-out ignoring what the neighbors want,” Quillen said. The Salhas stand in the back of the crowded June planning commission meeting. Most public comment was opposed to the camp. Previously, the board of Rose Township, which borders David Salha's property, voted 5-0 to request that the county deny his permit. The property is in Goodar Township; their board voted 3-1 on a resolution to offer no objection. At the planning commission meeting, Goodar Township resident James Allen said he was tolerant of all races and religions, but questioned the site's proposed name, "Camp Amen," and told the panel he thought the white and Christian community should "have the right to know if this is a Satanic church going in here, if it's Pentecostal, Muslim, whatnot." "Do you know what they’re teaching them underprivileged young Muslims today?” he told HuffPost, predicting cultural clashes between camp attendees and residents. “There’s a big anti-American sentiment going on in that community today, big. And up here is a very pro-American [community]. ... I’ve fought and watched many men die for the flag that these guys are stepping on down there." Salha explained to the crowd that the nonreligious camp is named after his son Amen, a word spoken as an affirmation in both Muslim and Christian traditions. "ISIS killed more Muslims than any other organizations. I hate ISIS," he said. "Of course there's bad Muslims. I don't blame any of you at all for worrying and for being concerned." Others at the meeting insisted terrorism- and religion-based objections don't reflect the community as a whole. Some apologized to Salha. David Salha stands with his family and addresses concerns over his plan to build a summer youth camp on his property at the Ogemaw County Planning Commission meeting in West Branch, Michigan, on June 24, 2015. “The concern over ISIS has been greatly exaggerated and completely misguided,” said Vijay Kumar, treasurer for the Lupton-Rose City Chamber of Commerce and a Republican candidate for state representative. An Indian immigrant who moved to West Branch 20 years ago, Kumar supports the camp but thinks Salha could do a better job answering questions from the area’s “very receptive, very open-minded and very caring” residents. Muslims are viewed more coldly than practitioners of other religions in the country, and Americans' opinion of U.S. Muslims has declined in recent years. One in three thinks Muslims in the U.S. are more sympathetic to terrorists than non-Muslims, according to a 2011 CBS and New York Times poll. Saeed Khan, a lecturer in the Near Eastern and Asian Studies department at Detroit’s Wayne State University, said Islamophobia often appears as a “presumption of suspicion” for Muslims. “Now, because you don’t know anybody as well as you think you do, everyone [can be seen as] sort of a sleeper cell if they’re a Muslim or an Arab,” Khan said in a phone interview. Protesters and counter-protesters rally outside the Islamic Community Center on May 29, 2015 in Phoenix, Arizona. Crowds gathered in response to a planned "freedom of speech" demonstration where attendees were encouraged to bring weapons and "draw Muhammed." Khan connected Salha's plans to other developments around the country facing resistance, like a proposed Muslim cemetery that residents of a Texas town are trying to block. The Pew Research Center identified at least 50 recent instances of controversy over mosques in U.S. cities, with concerns ranging from terrorism to traffic congestion. “Zoning becomes a very convenient foil,” Khan said. The Muslim community is "the one group that is still perfectly acceptable to speak about in rather pejorative, even bigoted terms," he added, particularly in conservative media and the political sphere. Islamophobia can be heightened when an American Muslim is involved in a terrorist incident or other serious crime, like last week's shootings in Chattanooga, Tennessee. Mohammod Abdulazeez allegedly fatally shot five servicemen before being killed. His motive is still unclear, but Khan said the tragedy could be seen as validation by those prejudiced against Muslims, like a Florida gun shop owner who this weekend declared that his store is a "Muslim-free zone." 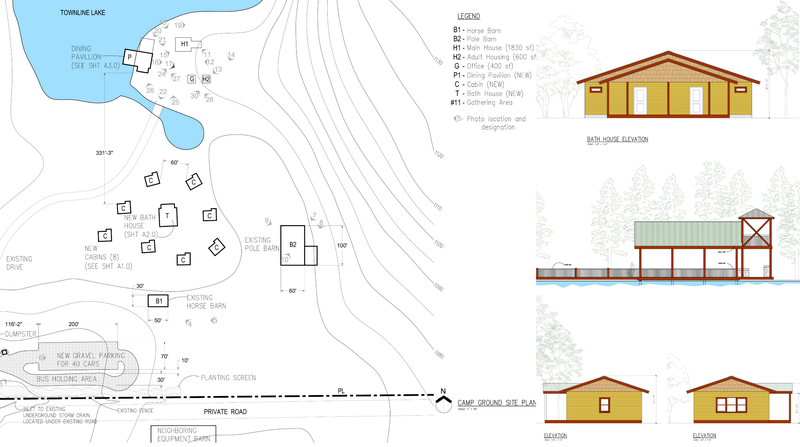 Salha’s camp plan comes eight years after he purchased the lakefront property, including a couple of cottages, for family vacations and hunting. He had never before faced outward prejudice in Lupton, a tightknit town with 350 residents, almost all of whom are white. The Salhas’ primary residence is in Dearborn, a Detroit suburb with one of the largest Arab-American populations in the country. The camp would be a place for Salha and his wife to bring Amen’s Boy Scout troop and his youngest daughter’s Girl Scout troop. Preparing for retirement, Salha plans to rent it out to other youth groups to subsidize taxes for his sprawling, wooded retreat, where he once watched in wonderment as a baby black bear ate a duck and then washed his paws in the lake "like a human." The Ogemaw County Planning Commission is likely to vote on Salha’s proposal on Wednesday after tabling the issue for the past two months. The Ogemaw County Planning Commission put off a vote on David Salha's proposal in June. Usually, no one from the community attends planning meetings, but the room was full in June. County Sheriff Howie Hanft assigned a deputy to the meeting at a board member’s request. “There’s a lot of tension up here,” Hanft said. Hanan was "embarrassed" as she listened to neighbors criticize her dad’s plans. But she still stood when he attempted to quell some tensions by describing how his mixed-religion family bucked stereotypes, and his love for his land and the outdoors. The Salhas had arrived at their vacation spot earlier that day, driving past a gate adorned with two small American flags, through towering red pines and up to the stone cottages and lakeside deck, where they had a summer cookout with shish kabob and hummus. “I wanted to show them we are an ordinary family," Salha said. UPDATE: 9:30 p.m. -- The Ogemaw County Planning Commission voted 4-3 Wednesday to deny Salha his request for a special-use permit to build the summer youth camp on his property. Still, Salha said he isn’t deterred from his plans to build the camp. The commission opposed the permit in part “because it would not be harmonious with the secluded nature of the neighborhood,” according to the motion put forth by Commissioner Ron Quackenbush. The board didn't cite Salha’s religion or the previous concerns about terrorism as reasons for their decision. “It’s just not a viable feasible thing, in my opinion, for that particular neighborhood,” Quackenbush said. Salha pointed to one commissioner’s comment that in many ways, his proposal was similar to nearby summer camps in residential areas that had faced no opposition. “As an American, I should not be refused for things that other camps was not refused for,” he said after the meeting. Salha is still considering his next move, but does not plan to scrap his plan for a camp. He may appeal the commission’s decision. Two kids bounce on the trampoline at David Salha's property in Lupton, Michigan.